It is quite possible that I got a little distracted this week at the farmer’s market. I’m not ashamed. This is the time of year when my thoughts turn not to what I should be doing, but rather what I will be doing in less than a month. You guessed it; vacation. To a sunny beach house. For three weeks. And once Memorial Day passes, it’s all I can focus on. I also got distracted by nectarines, but that’s different story entirely, and one which you’ll hear about soon. So, I went to the market, but as my heart is already sitting under an umbrella sipping fruity drinks, this is what I came out with. I give you the “I’m so ready for vacation already” crab salad. On vacation, I indulge myself with super-fresh fish. Believe anyone who says you can taste the difference in fish near the water versus fish, even the freshest of fish, carted in to the middle of the country where I am. There’s a difference. It’s a big one. If you happen to be near the sea, run to the nearest place you can buy fresh fish and load up. If you happen to live near the sea, know that I envy you, especially at this time of year. Because you have crab boils, and lobster boils, and delicious things with exoskeletons I can only dream about most of the time. Typically, you people by the sea (at least in the northeastern part of the States, you know who you are) also have access to incredible blueberry pies, which is just salt in the wound. I mean, really; do you also frolic with herds of pegasus? Probably you do. Thankfully, I’ll be heading south soon, and the fish will be waiting. Until then, I’ll be making this salad. The farmers’ market blessed me this week with tomatoes, beautiful lemons, and some absolutely perfect avocados. I grabbed a few Kalamata olives, baby arugula, and crab meat from my local market and had the remaining ingredients at home. This one is another Bobby Flay recipe, and like the last one, it has two dressings. I’m starting to really like that, because none of the dressings are difficult to put together, they can be used for other basic salads if you wish, and they play off each other exceptionally well. The first dressing is a creamy smoked paprika number which gets tossed about with the chunky ingredients, and the second is a lemon vinaigrette you add to the baby arugula base. I made some changes to the original recipe, more to the technical aspects and less to the spirit of the salad. First off, no: I don’t get blue crab here without a fuss, and I suspect only some of you may have access to it as well. Instead, I got the nicest sort of lump crab I could find at my local grocery store. Also, even I can’t find microgreens without a special trip to Whole Foods (and I don’t know if they always have them), so I substituted some baby arugula, which always adds a nice peppery punch to salads. The lemon vinaigrette was originally made with Meyer lemons, and I would encourage you to try it in that form; it’s outstanding as a “go anywhere” dressing for summer salads. This version uses regular lemons; I thought that bright, tart flavor would really bring out the crab. Happily, it did, and I think in the future, I’ll use the regular lemon variety for any sort of fish. I wish you a happy first-week-out-of-school, start-of-vacation, time-for-summer day with this one. 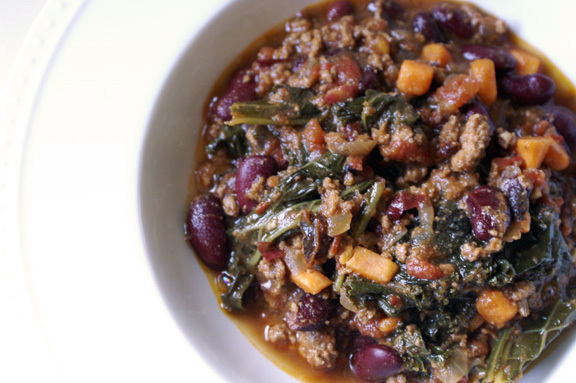 Adapted from the Bar Americain Cookbook by Bobby Flay with Stephanie Banyas and Sally Jackson. I know Mr. Flay is all grilling and contest-judging on the Food Network, but this book has something in it for everyone, and so far, it’s all been outstandingly good. Note: this makes 4 servings. 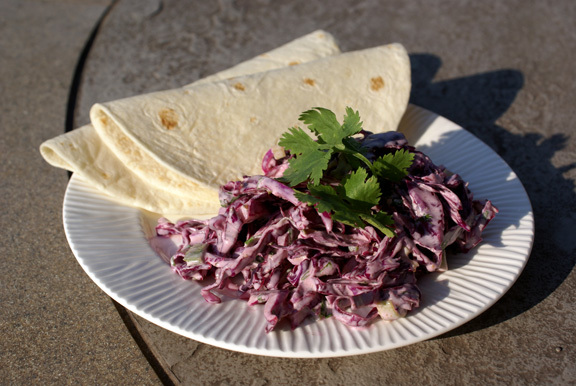 it’s not difficult to halve or even quarter the recipe, so it makes a great salad, even if you’re eating solo. I suggest making a full lemon vinaigrette no matter how many people you’re expecting; I promise, you’ll find a way to use it up. 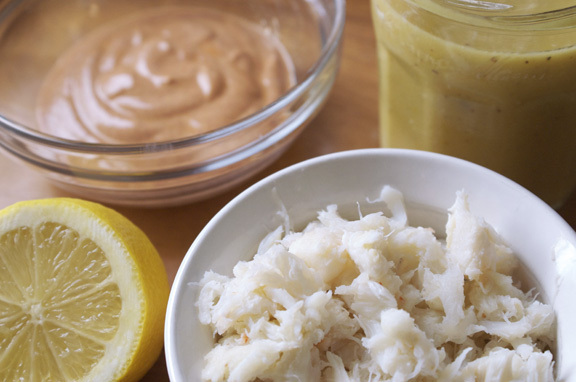 Whisk together the lemon zest and juice, vinegar, mayonnaise, mustard, and honey in a medium bowl. Pour the oil in a slow, steady stream into your mixture, whisking the entire time, until emulsified. Season with salt and pepper, and place in the refrigerator to chill until your salad is ready. Whisk together the mayonnaise, greek yogurt, vinegar, paprika, and cayenne in a large bowl. Season with salt and pepper. Reserve about a 1/4 cup of the mixture in a medium bowl. Add the avocado, olives, and tomatoes to the remaining dressing and fold gently to combine. 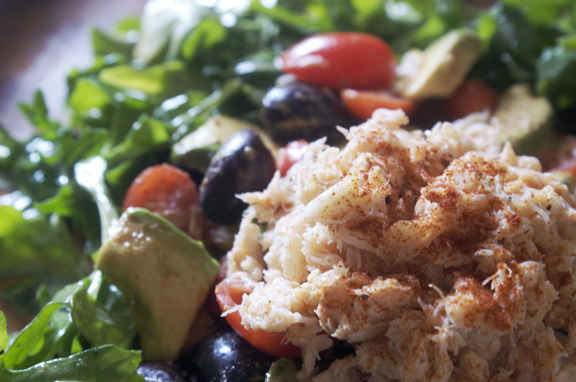 In the bowl containing the reserved dressing, add your crab meat and fold gently to coat. Put the salad greens in a large bowl, and going slowly, add some of your lemon dressing. Toss to coat, and add more as needed. Season with salt and pepper to taste, then arrange the greens on 4 plates. 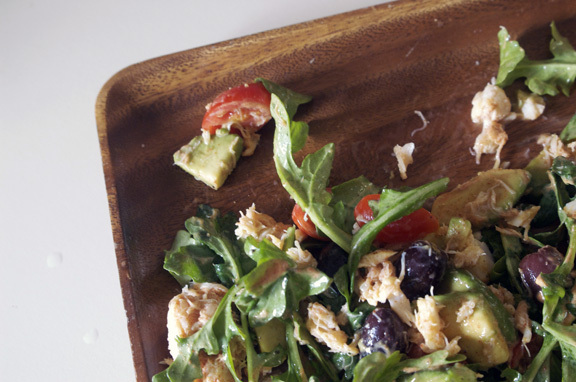 Slowly add your tossed olives, tomatoes, and avocado over top of the greens, being careful not to mush anything. Finally, add the crab over the top. Serves 4 people, preferably under a summer sun. 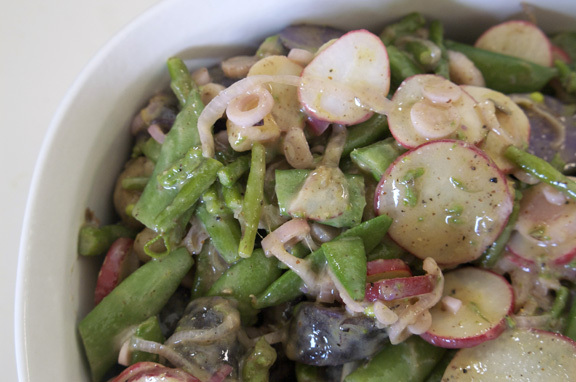 spring potato + vegetable salad. Yum. This salad looks delicious and I’m totally jealous of your 3 week vacation! julie, thank you so much! i love that i get to to my long vacation; it’s a little luxury i have allowed myself since i stopped working full time to stay at home with my (now) toddler. this will be our second long one, and i’m THRILLED to be doing it. last year she had such a great time, but she was just shy of 1 year old. this year, she’s older, walking/running steadily, and so, so aware of what’s going on. she’ll love all the swimming and beaches and wildlife. i can’t wait. Oh, the Pegasus, how they abound here! I’m kidding. At least you have fresh tomatoes at your farmers market already! We won’t see those for another month. My vacation officially begins on Wednesday, and I, too, am finding it difficult to focus on anything other than lobstah and blueberries. we get some really nice tomatoes pretty early, and we are lucky like that. we haven’t quite gotten to where they get that heady tomato smell all over your kitchen, but almost. happy vacation (soon)!! i’m happy you share the same issues i do when it comes to concentrating on anything but summer food. i know you’ve got people coming, and i’m sure they’ll appreciate both lobstah and blueberries. Come on Shannon, the Pegasus Festival isn’t until August. I know you’re jumping the gun a bit with this post in general, but girl, please. I’m going to kill it with blueberry picking this summer. KILL. IT. I also really like crab. That is all. I. KNEW. IT. i bet they’re rainbow-colored pegasus too, you northeastern secret-keepers. oh, i have no doubt you’ll kill it. i may kill it a bit myself, because we have some really great blueberry farms around here where you can pick your own. We used to go every year when i was little because mom could take advantage of her free child labor. we adored it, my sister and i, but it was typically a long, finger-stained, bee-swatting day. i also enjoy myself some crab. So, I checked the mail for my ticket/invitation to the beach house. It didn’t come today. You may want to get on that. I’ll make you anything you want if I get to sit next to you on the porch at the beach house. Also, I just added these ingredients to my shopping list. Because I just got home from work on my real last day (because Friday wasn’t it) and I deserve a crabby salad. Because I’m a little crabby. margaritas and crab(by)! the earth’s most perfect pairing. I live by the sea. And one of my dearest friends has an organic blueberry farm about an hour from here. With loads of sheep. Just sayin’. One day, when you come for a visit, we’ll fill your belly with lobster and blueberry pie. I need to start making two-dressing salads. Clearly, it’s what all the cool people do. The avocado and olives in that there salad are making my mouth water. Or maybe it’s the lemon? It all sounds so fresh and… fresh! when i come to visit, we’ll have so much to do; i’m so excited for my upcoming blueberry farm/sheep herding/lobster scarfing/ staring at the sea visit someday, i can’t even think straight. do you know i’ve never frolicked with sheep? not one time. and i completely want to. this two-dressing deal is one i wish i could have started; the cool kids always do everything before me. I’ve noticed it’s my male-authored cookbooks (mssrs carmellini and flay) that have them. maybe men aren’t as afraid to slather their food in duo dressings? interesting. say hi to the pegasus herd for me; tell them i’ll see them soon. If there’s one thing to be said for Bobby Flay, he definitely knows how to infuse his recipes with flavor! Nicely adapted! hi kale! so true; he knows what he’s doing with flavors; everything i’ve made from this book has been delicious, and he’s got some very exciting combinations going on. thank you!